A second order partial differential operator is applied to an image function. By using a multigrid operator known from the so-called approximation property, we derive a new type of multiresolution decomposition of the image. As an example, the Poisson case is treated in-depth. Using the new transform we devise an algorithm for image fusion. The actual recombination is performed on the image functions on which the partial differential operator has been applied first. A fusion example is elaborated upon. Other applications can be envisaged as well. de Zeeuw, P.M. (2005). A multigrid approach to image processing. In R Kimmel, N Sochen, & J Weickert (Eds. ), Scale Space and PDE Methods in Computer Vision (pp. 396–407). Springer. 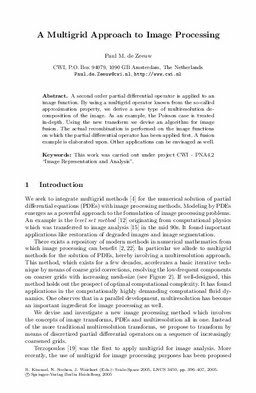 A multigrid approach to image processing.